New York Giants quarterback Eli Manning talks to reporters about the memorabilia fraud charges against him in a lawsuit filed in 2014. 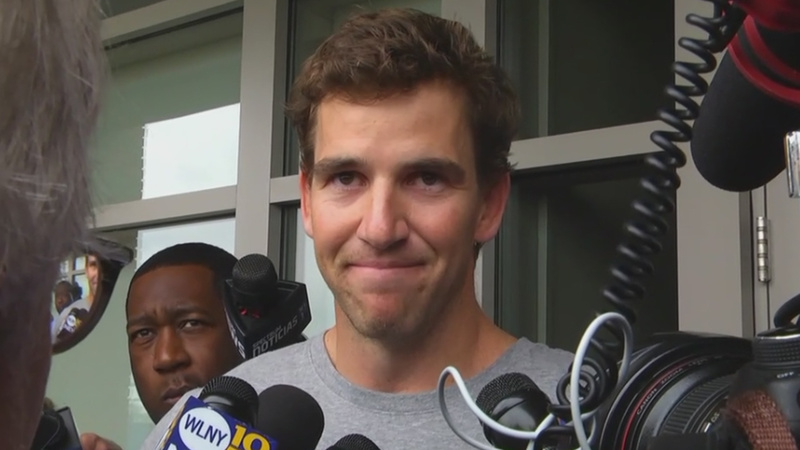 NEW YORK (WABC) -- New York Giants quarterback Eli Manning is strongly denying accusations that he knowingly provided fake game-used memorabilia to collectors. A civil racketeering lawsuit filed in court in 2014 resurfaced following emails obtained by the court showed Manning had tried to pass off team gear as "game worn." "I've done nothing wrong and I have nothing to hide," Manning said Thursday. Manning turned over a potentially incriminating email from 2010 earlier this month in connection with the lawsuit that claims the quarterback, the Giants and a team equipment manager knowingly provided memorabilia that was not worn in games. According to court documents, in the email, Manning asked for helmets that can be passed as "game used." Those helmets were tabbed to be sold by memorabilia dealer, Steiner Sports. Manning said he was angry about the claims and that the emails were "taken out of context." In addition, a source told ESPN's Jordan Raanan that Manning and the Giants submitted a new filing Wednesday that they believe will clear Manning's name. "I've tried to do everything with class and be a stand-up citizen," Manning said. "That's what I have done and that's being attacked right now. The plaintiffs' lawyer, Brian Brook of Clinton, Brook & Peed, told ESPN that the email, included among roughly 200 pages of documents Manning produced as part of legal discovery, was key to specifically linking the quarterback to the lawsuit, which alleges an elaborate scheme to produce, pass off and sell memorabilia as game-used that was not. The email was included in a court filing in Bergen County (N.J.) Superior Court by the plaintiffs -- collectors Eric Inselberg, Michael Jakab and Sean Godown -- who first filed suit three years ago.